Legend of the Galactic Heroes truly lives up to its name: it takes the reader on a journey across several centuries and many light-years to tell a story that confirms what we know about human nature. Greed- for power, wealth, etc.- will always exist and always corrupt; battles and wars are won and lost based on strategy and nimbleness of mind; and those who send soldiers off to war with grand rhetoric are sometimes the most cowardly. This first book in the 10-volume series (begun in 1982) offers a sweeping view of human history up to 2801 AD, when humanity has left the Earth far behind and given birth to the Galactic Empire. A rival alliance forms from refugees seeking to escape the Galactic Empire’s despotism, resulting in the Free Planets Alliance. A permanent state of war exists between them, with a small planet-state (Phezzan) maintaining a precarious relationship with both, while promoting its own interests by playing them off one another. Thus the balance of power in humanity’s corner of the universe. 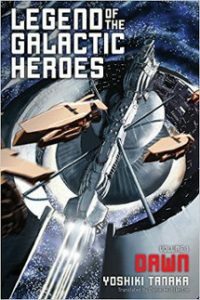 What makes this military space-opera particularly interesting to me is how it explores the reasons for war and how war is used by the powerful to achieve specific ends. Each side in this war is represented by a brilliant tactician- the Galactic Empire has Reinhard von Lohengramm, while the Alliance has Yang Wen-li. Both are young, creative, and capable; Yang, however, is the opposite of ambitious. Having chosen a military career as a last resort, Yang is determined to finish out his mission and then retire to spend more time doing what he really loves- studying history. A new round of fighting, however, upends this plan, and Yang is put in charge of his own Alliance Fleet, thanks to his remarkable tactics and the fact that he repeatedly loses the fewest number of battleships and soldiers across the Alliance. His distaste for war, especially when it is encouraged by politicians and commanders who only seek their own glory, is deepened by his frustrations with fellow commanders’ foolhardy strategies and the hawkishness of the Alliance government. On the opposite side stands Reinhard von Lohengramm, equally brilliant but also ambitious, a man who not only seeks to shore up the Galactic Empire’s territory, but also become the emperor himself, eventually.